Hawaiian Promotion Committee, Honolulu, H.T., 1904. A booklet for promotional activities, it was widely distributed with local hotels providing complimentary copies to their patrons. "For the purposes of reproduction in magazine or newspaper, the copyright on the contents of of this volume is waived." On page 15, captioned "Surf Boating and Riding at Waikiki," there is one photograph of canoe surfing, one of several prone of boardridrers, and one of a lone standing surfer. The images are accredited to Rice and Perkins, the page design by Julian Greenwood. The standing surfer photograph was later reprinted by several newspapers. The three images were also reproduced on an (hand-coloured?) "undivided back" postcard (circa 1901-1907) with the caption "Surf Riding at Waikiki,Honolulu." - DeLaVega: Surfing in Hawai'i (2011), page 34. All three images were also reproduced as a hand-coloured individual postcards. 1904 Rice and Perkins : Surf Boating and Riding at Waikiki. Soft cover, 69 pages, 35 colour photographs, 6 black and white photographs, 5 black and white maps, 11 pages advertising. 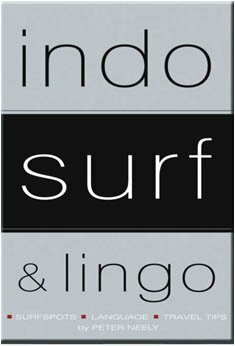 Early Indonesian surf guide with a large section devoted to language translations. PO Box 714 Noosa Queensland 4567 Australia, 2003. 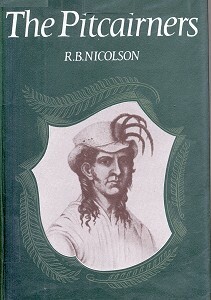 First edition 1992 (see 1994 edition above). "The original Surfer's Guidebook to Bali and all Indonesia. Regularly updated and reprinted every few months in Kuta, Bali"
2003 Edition update and image contributed, with thanks by Peter Neely. PO Box 714 Noosa Queensland 4567 Australia, 2004. How to be a Surfer. Soft cover, 152 pages, 23 colour photographic plates, black and white photographs and illiustrations, Glossary. 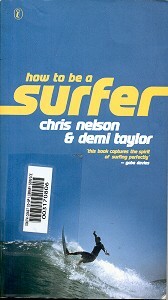 Very basic juvenile instructional book directed at UK surfers. Chapters on History (Chapter 2) and Design (Chapter 4) are rudimentary. The illustrations are an unappealing combination of and surfers and boards drawn over original photographs. This copy, courtesy of Shoalhaven City Library. Angus and Robertson, Sydney, 1965. Hard cover, 222 pages, black and white plates, Appendicies, Bibliography, Index. North Atlantic Books, PO Box 12327 Berkley, CA 94712, 1989. 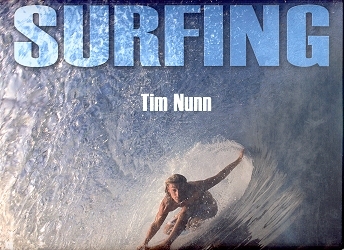 A chronologically scattered but interesting account of surfing and a life. - the infamous “da Cat’s Theory of Evolution” ad for Greg Noll Surfboards (photo section). 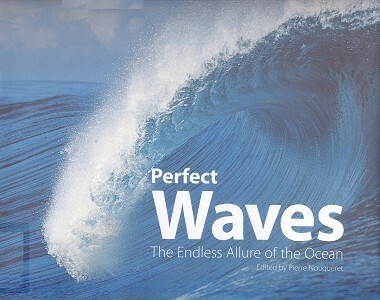 The Perfect Wave - The Endless Allure of the Ocean. Harry N. Abrams, Inc., 115 West 118th Street, New york, NY 10011. Hard cover, 161 pages, one black and white photograph (pages 10-11), colour illustration (pages 18-19,page 34), colour photograhs, Further Reading, Contributors, Acknowledgements, Photo Credits. Originally published in French by Herme, Paris in 2004. English translation by Nicholas Elliot, 2006. An extensive collection of global wave portraits (only a small selection with riders, all unaccredited) by Sylvain Cazenave, Eric Cauche, and Tim McKenna. The essays by Gillaume Dafau, Alexandre Hurel, and Pierre Nouqueret cover various aspects of wave formation, some notable breaks, and the art of surfriding. The so-called "Hawaiian method" of estimating wave height is discussed, and repudiated, on page 158. The text is not without error : " (Mickey Dora) never accepted sponsors, participated in competitions, nor sat for photos or interviews", page 152. 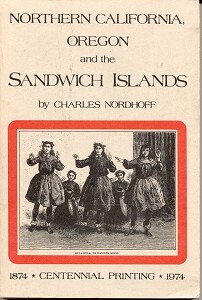 Northern California, Oregon and the Sandwich Islands. Harpers and Brothers, New York, 1874. Reprinted Ten Speed Press Box 4310 Berkeley, California 94704. 1974. Soft cover, pages, black and white illustrations. 1873 Charles Nordhoff : Surfriding at Hilo. A Division of Book Sales Inc.
114 Northfield Avenue, New Jersey 08837, 2007. Hard cover, pages, Glossary, Colour Photographs. Extensive photograhic images from around the world circa 2006, most by the author. The format is extremely (excessively?) large and will not fit comfortably on most bookshelves. Even with this massive page size, many images are printed across two pages, with the inevitable join in the centre. Cover image, right is cropped directly by an A4 scanner. Geoff Cater (1999 - 2016) : References - Books - N.